Ron and Joan Fong, May 2017. Ron Fong, in a note sharing word of his wife’s passing with her many friends and family, highlighted Joan’s exceptional bravery, determination, and grace. He asked for others to honor her memory by living “a quintessential life—a model, exemplary life worth imitating.” Friends and family will be remembering Joan Sunday, September 24th by joining a 5K Lung Cancer Fundraiser Walk/Run at the 9th Annual “Your Next Step is the Cure” event in San Francisco. You can donate or register to be a Team Joan 2017 walker/runner at http://bit.ly/2017TeamJoan. 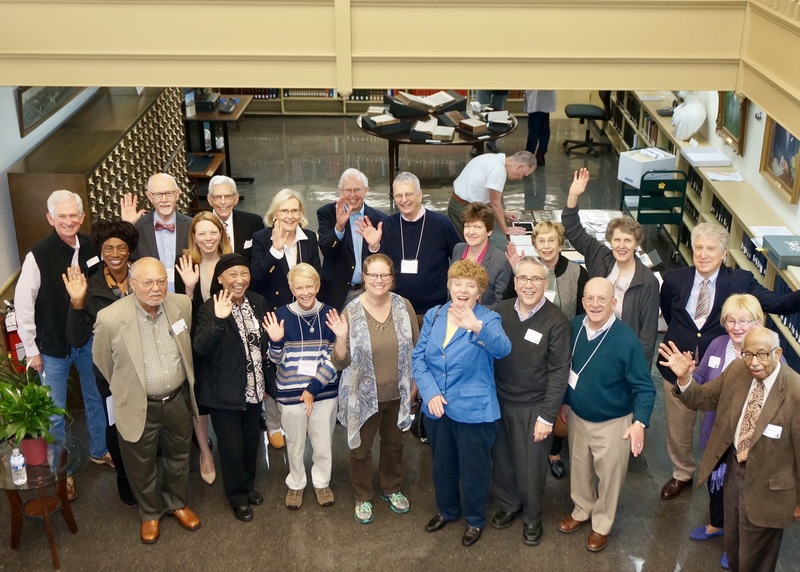 PHS staff members, board directors, and advisory council volunteers had the pleasure of sharing Joan’s company at our spring “Taste of History” event and Advisory Council-Board of Directors meeting. Joan and Ron made the trip across the country from California as part of the inaugural Advisory Council class. Joan charmed all of us with her humor, sharp intelligence, persistent faith, and wonderful cheer. As you can see from the photos featured here, most taken by Ron, she lit up every space she entered. Steve Grace, Joan Fong, Beth Hessel, May 2017. PHS Board and Advisory Council Members, May 2017. As her obituary notes, Joan was raised in the San Francisco Bay Area, where she graduated from Buchner High School, the University of California-Berkeley with a double B.S. in Bacteriology and Genetics, and Cal State-Hayward with an M.B.A. She worked in finance, insurance, computers, and biopharmaceuticals before retiring early from the Jack Lee Fong Insurance Agency after being diagnosed with lung cancer from a genetic mutation common in Asian women. In addition to PHS, Joan volunteered and supported many organizations focusing on the performing arts, children’s education, and Christian work at the local, regional, and national levels. Her assistance to others included serving as Alameda County Library Foundation Chair, Founding Director of Pan Pacific Bank, Chair of the National Asian Presbyterian Women, Board Member of The Insurance Board, Vice Chair of the Synod of the Pacific, Finance & Property Chair of San Francisco Presbytery, Board Director of Mission San Jose High School Parents of Universal Performers, Chair of Loans of the Mission Development Resources Committee of the PC(USA), and a member of Irvington Presbyterian Church, where she taught Sunday school, and led Bible study. Jane Carl, Joan Bergsteinsson, and Joan Fong, May 2017. Joan is survived by Ron, her husband of 32 years; sons Alexander, Theodore, and Nicholas; mother Helen Chen, and siblings Velma, Louise, and Jim. She is preceded in death by her father C.T. Chen. As Ron pointed out in his note, Joan packed a decade’s worth of quintessential living into her last four years—celebrating Nicholas’s graduation from Mission San Jose High School, Theodore’s college graduation from the United States Military Academy at West Point, and the Fong’s 30th wedding anniversary; riding bikes around European castles; seeing a Hawaiian volcano at sunrise; and volunteering across the United States. Her faithful example is indeed worthy of imitation. PHS is so grateful for the long friendship we and many others were able to share with Joan.